How To Minimize PHL Airport Hassle 24hrs Before Departing On Your Adventure. Hassles at the airport are never the highlight of anyone’s vacation. Airports are busy; you never quite know how much time you’ll need before checking in, or how conveniently located your gate is. Philadelphia International Airport (PHL), which was described by Business Insider as one of the ten most frustrating airports in America, is no exception. However, there are many things you can do the day before you leave to make sure your airport experience is a snap. Here are some handy tips to help you start your trip off on the right foot. Delays at the airport are frequently caused by luggage, with too many passengers overloading their suitcases, leaving them overweight, or thinking a way too big bag will be ok as a carry-on. Remember to check with your airline’s weight policies, and if you think your suitcase is borderline – it’s time to scale back. For your carry-ons, keep in mind that on a packed flight overhead storage is limited, and again, if you think your carry-on might be in the upper limit of what’s allowed, just check it. In the end, you’ll save time. Philadelphia International Airport’s website suggests passengers arrive at the airport a good two hours before a domestic flight, but at least three hours before an international flight. Also keep in mind how long it’ll take you to get to the airport, depending on what kind of transportation you use. PHL is easily accessible by train service, connecting downtown to the airport. Trains leave every thirty minutes and operate from 4:52 am to 11:52 pm. If you’re driving to the airport and need to figure out what to do with your car, consider One Stop Parking. You’ll be issued a safe, convenient, affordable parking spot and provided with free shuttle service to the airport. Otherwise, a full list of airport parking rules can be found at the Philadelphia Parking Authority’s website. Rather than waste time checking-in at the airport, simply do it yourself the night before from the comfort of your own home by using your airline’s website. Also be sure to check with PHL’s flight search to make sure your departure time hasn’t changed, and that your flight is still operating as scheduled. 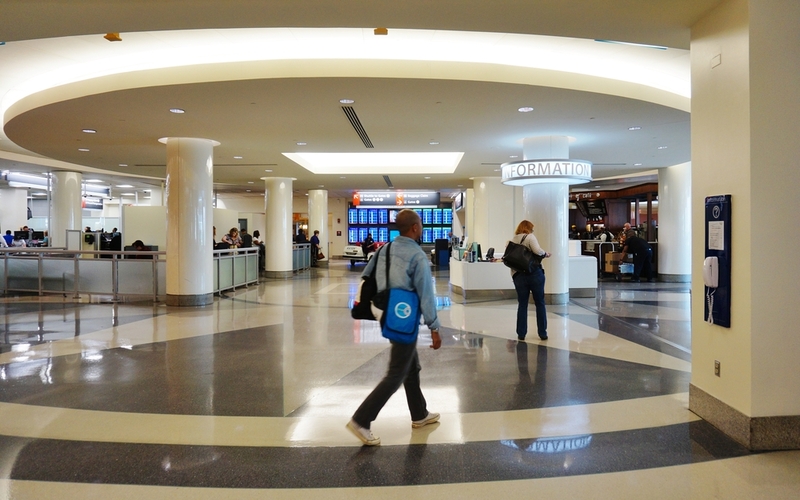 If you’ll be catching a connecting flight at PHL during a tight layover, it’s good to know how to navigate the airport before you land in order not to lose time. Free shuttle service on the secure side connects all the terminals, meaning you’ll save time by not having to pass through security again. If your connecting flight isn’t international and is in terminal A, B or C, you should be able to walk it in a relatively short amount of time. For more information on Philadelphia International Airport (PHL), including flight and transportation delays, visit phl.org.